People bothered by their big, protruding, or disfigured earlobes can consider surgery to fix them. Affordable earlobe surgery in Mexico is a good option for people seeking an inexpensive way to feel good about their ears. Any form of plastic surgery in First World countries is pricey, and most insurance providers, particularly in the US, do not cover elective procedures. Global competition resulted in great strides to provide low cost, high quality treatments which, in turn, helped push the development of medical tourism in Mexico. There are a high number of Americans who undergo ear surgery every year. According to Ear Surgery Statistics released by the American Society of Plastic Surgeons (ASPS), a total of 27,332 ear surgery procedures were performed in the US in 2009. In the same year, Americans spent more than $80,000,000 on ear surgery alone. With cosmetic ear surgery in Mexico, they would have saved more than half of that. Liposuction and facelift in Mexico are some of the other cosmetic procedures popular among medical tourists. Earlobe reduction makes the earlobe smaller and proportionate to the size of the ear. How much does earlobe reduction cost in Mexico? Earlobe reduction price in Mexico is 50%-70% cheaper than the prices charged in the developed countries. Since you’re getting an ear reduction in Mexico, you might as well get a facelift at the same time and enjoy greater savings. Ear augmentation fixes underdeveloped or non-existent pinna (outer ear) by using cartilage implants and skin grafts to reshape the ears. Check whether the implants are FDA-approved. Pinnaplasty improves the appearance of protruding ears by pinning down the cartilage with stitches to make it bend backwards towards the head. Make sure to find a highly-skilled plastic surgeon to handle your pinnaplasty in Mexico. Tribal ear piercing using “flesh tunnels” results in stretched or split earlobes. Stretched earlobe repair in Mexico can correct that at a very minimal cost. Any physical activity or interaction that could hurt your ears should be avoided for up to two months after undergoing earlobe reconstruction in Mexico. The comparatively low earlobe reduction surgery cost in Mexico rewards the patients with great savings. Many medical tourists prefer plastic surgery in Mexico not only because it’s affordable, but more importantly because of the high quality of treatments. Mexico is proud to have highly-competent and internationally-trained plastic surgeons, quite a few of whom are also fluent in English. Leading hospitals and cosmetic surgery clinics in Mexico have state-of-the-art facilities and advanced technology to ensure high standards of health care. Make sure to choose a clinic accredited by the Joint Commission International (JCI). Mexico is considered one of the best tourist spots in the world, filled with beautiful beach resorts and ancient structures. A great way to enjoy plastic surgery for ears in Mexico is to combine it with a vacation and visit the breathtaking tourist destinations anywhere in the country. There are daily flights to Mexico from many US cities. Driving from California and Arizona to Mexico takes only a few minutes to a few hours. Certain foreign nationals, including Americans and Canadians, only need to present a valid passport to enter Mexico for up to 180 days for travel purposes or 30 days for business. Enjoy swimming and water activities in Baja California. Visit the archaeological sites of Chichen Itza. Savor the scrumptious Mexican dishes – enchiladas, tacos, tamales, tortas, quesadillas, and guacamole, etc. Enjoy non-alcoholic beverages such as horchata, agua de Jamaica, champurrado, atole, and refrescos. Tourists in Mexico are advised to get a cab by calling a taxi company, requesting the hotel to arrange for one, or by hiring from an established post or Taxi de Sitio. 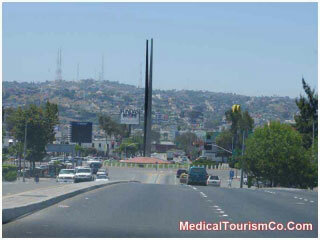 Planning a grand vacation like this can turn a simple earlobe surgery in Mexico into a wonderful experience. The satisfied patient will return home with a better appearance, improved self-esteem, and happy memories. 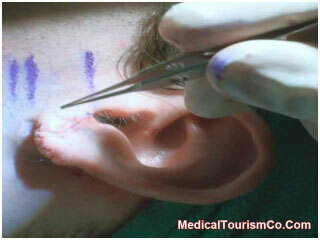 Medical Tourism Co. facilitates low-cost Earlobe Surgery in Mexico. For more information fill-out the estimate-request form.